NASA's first 50 years have seen both triumph and tragedy as the U.S. space agency sent unmanned probes to other planets and the fringe of our solar system, landed the first astronauts on the moon, built the world's first reusable manned spaceship and worked alongside other countries to construct the International Space Station. The agency first opened its doors on Oct. 1, 1958 and is currently working to complete the International Space Station by 2010, retire its aging three-space shuttle fleet and develop the new Orion and Ares rockets that represent designed to ferry new human explorers to the moon by 2020. "In my personal opinion, I'd like our mission in 50 years to be focused on exploration of other planets," said Steve Lindsey, NASA's current chief astronaut. "Hopefully we'll get to Mars before that 50 years is up." There have been many since, but the launch of Explorer 1 on Jan. 31 in 1958 marked the United States' first foray into off-planet research. The small satellite lifted off atop a Juno 1 rocket and operated in orbit for 100 days to study cosmic rays in a region that was later known as the Van Allen radiation belt. It took 12 years, however, for the spacecraft to ultimately reenter the Earth's atmosphere and be destroyed. Beat by the Soviet Union but not out of the Space Race, NASA bounced back on May 5, 1961 when Mercury astronaut Alan Shepard launched into space atop a Redstone rocket to become the first American spaceflyer. But unlike the Soviet Union's orbital success of cosmonaut Yuri Gagarin, Shepard's flight lasted just 15 minutes in a suborbital hop. Technically two missions in one, NASA's "Grand Tour" of the outer solar system launched the Voyager 1 and 2 probes in 1977 on a 12-year flight to the gas giants Jupiter, Saturn, Uranus, Neptune and their moons. The spacecraft returned stunning images and data of the outer planets and carried golden records bearing the images, greetings and sounds of Earth to the stars in case alien life forms should find them. NASA's Apollo 8 and Apollo 13 missions to the moon range from success to failure and then success again. On Dec. 21, 1968 Apollo 8 launched on a stunning first manned trip around the moon, with its three-man crew beaming home the first visions of Earth's satellite as seen by living, breathing astronauts. Apollo 8 pilot Jim Lovell also commanded the unlucky Apollo 13 in April 1970, where an explosion forced the crew to abandon the third lunar landing mission and use their Aquarius lander as a lifeboat. The exhaustive effort by NASA engineers, during which then-flight director Gene Kranz was said to coin the phrase "Failure is not an option," ended in the safe return for Lovell's crew. They landed on Mars in January 2004, but the hardy rovers Spirit and Opportunity have far outlived their initial 90-day mission in what are arguably NASA's most successful Martian invasions to date. Building on the success of the first Mars landings (Viking 1 and 2) and the first rover (little Sojourner), Spirit and Opportunity have found evidence of surface water in the planet's ancient past, studied their own landing remains and explored meteorites, craters and other Martian tourist spots. The rise of NASA's reusable winged space shuttle in 1981 launched a new era in which human space appeared routine. But the stunning explosion and loss of the shuttle Challenger and its seven-astronaut crew -- including New Hampshire high school teacher Christa McAuliffe -- just after liftoff on Jan. 28. 1986 proved a wakeup call for a complacent America. Not since the Apollo 1 fire of 1967, which killed three astronauts in a ground test, had NASA lost a spacecraft crew, though Challenger marked the agency's first in-flight space tragedy. The agency resumed shuttle flights in 1988. Launched in April 1990 with a defective mirror, the Hubble Space Telescope was initially billed as a colossal failure and expensive embarrassment. But an in-space service call by astronauts revived the telescope which has since become, 18 years and three more service flights later, an icon of space research and exploration as it peers back into the history of the universe. A fifth and final overhaul by astronauts is slated for October 2008. On the Saturday morning of Feb. 1, 2003, NASA's second shuttle disaster struck. The shuttle Columbia and seven astronauts were lost during landing due to heat shield damage sustained to the orbiter's left wing edge during launch. The accident sparked an intense investigation, after which NASA developed in-flight shuttle repair tools and methods, and was directed to retire its three remaining orbiters by 2010. The agency resumed shuttle flights in July 2005. A decade in the making and still incomplete, the $100 billion International Space Station is an unrivaled feat of engineering in space. The product of a partnership between NASA, Russia, Canada, Japan and European nations, the orbiting research station first took flight in 1998, with subsequent pieces added on during via Russian launches and U.S. shuttle flights. The three-person station is expected to double in crew size before its completion in 2010. It's been nearly 40 years, but the first human landing on another world -- the moon -- remains among NASA's pinnacle achievements in its five-decade span. 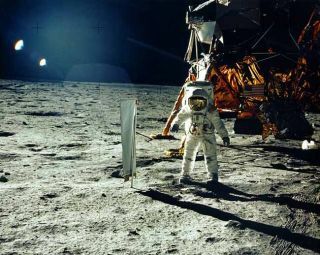 On July 20, 1969, after the Apollo 1 tragedy and series of successful tests in Earth and lunar orbit, Apollo 11 astronauts Neil Armstrong and Buzz Aldrin guided their Eagle lander to Tranquility Base on the surface of the moon while crewmate Michael Collins circled above inside the command module Columbia. The landing marked success for the U.S. over the then-Soviet Union what has since been billed as the Space Race. NASA plans to return astronauts to the moon by 2020 using its Orion crew capsules, Altair landers and Ares I and Ares V boosters. But unlike the Space Race days, the renewed effort is expected to be a cooperative international endeavor.